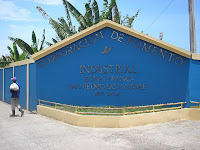 This week I’m at my apparel factory in the Free Trade Zone in the village of San Pedro de Macoris, Dominican Republic coordinating and planning back to school programs. Key staff or I come here about every third week; it’s a Monday through Friday drill, from 7 AM to sometime after 7 PM. With about 100 offshore employees, key relationship building, on the spot problem solving and being a good corporate citizen keeps you busy for the week. Expenses are minimal, a hotel room is $29 a night, roundtrip airfare is below $500 and the fillet mignon I had for dinner was a whopping 285 pesos or $8.50. It’s rewarding to be here and interact with the people who make our products, especially knowing every person here is supporting a family in a village where the unemployment rate is north of 20%. These jobs in an American factory are extremely hard to fill because first generation Americans with a cutting and sewing skill set are retiring in droves and their children have no desire to labor behind a sewing machine or a cutting knife. Many times I think it would’ve been better to keep the jobs in America that are now here in the Dominican Republic, but I come back to this very issue; the jobs I sent offshore are the jobs nobody wanted in the USA. The high paying jobs are what stayed in America. Corky’s core group of designers, managers, sales people and customer service associates have more opportunity for advancement than at any other time in our 15 years of business. Further, the skill set that they develop everyday in technology and global commerce make them a more valuable employee to any business. The turnover in our administrative jobs is very close to zero as compared to our turnover in the warehouse which runs about 25% annually. The management jobs are stressfully challenging, but provide a sense of purpose and this is the type of job most young people aspire. If you’re an American or Dominican you’re still a human being and neither ethnicity should feel entitled to more respect. However, opportunity is very discriminatory because some countries are further developed than others and where you’re born plays a large roll in the economic opportunities available. 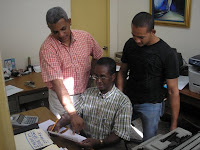 By providing opportunity to our employees here in the Dominican Republic, we’re helping the country develop economically and albeit in a small way we’re improving the opportunities that will be available to their children. Let me be clear about the treatment of our employees in the Dominican Republic. Everyone is older than 16 and receives a wage significantly above the legal minimum, the legal work week is 45 hours after which overtime pay is provided, medical care is provided to all and everyone participates in a retirement program. We could drastically reduce these costs, but I want the best people to work on Corky’s products. My mandate in the Dominican is simple, a Corky coat, swimsuit or dress should be a work of art and nothing less is acceptable. Yesterday morning I challenged my plant manager in a heated meeting as to why a five minute inspection was added to every coat coming off the production line, something we could never afford to do in the USA. 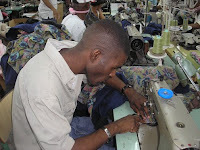 In the apparel business, even in the Dominican Republic, a savings of five minutes in a garment production cycle is huge; it’s equal to $3.00 at retail (in an American factory it would be $9.00 at retail.) On the flight here I made a firm decision to countermand his action. In the end the inspection stayed because he reminded me of my mandate, “a Corky coat should be a work of art.” For an increase of three dollars at retail, every seam inside and outside of the jacket is inspected, every embellishment and button placement is measured to spec, the fabric is checked for the smallest defects, thread colors are checked and finally the coat is put on a hanger and it must pass a very subjective test of being ascetically pleasing. Senor Solano, thank you for standing your ground. Alan Hi!! 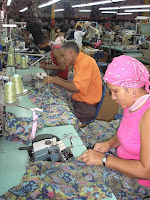 Great Post about labor in Dominican Republic!! I wanted to say thank you for helping the economy out there. I felt your post. I was born there and lived part of my life in Dominican Republic, being that I lived it, I can totally relate to your experience. I'm now 30 something :) years old and have my own company. I can't wait for the day when I head back to DR and help others like you are. Good for you. Thanks you for sharing your experience with us. You're an insightful person. Most Americans loss sight of the fact that economic opportunity is very discriminatory. Jobs that go unfilled in the US are sought after in other countries. Wherever we live, we're all humans and its in our nature to have hopes and dreams. Alan, I found one of your posts in its entirety on this other blog. Don't know if you knew or gave permission. It seems to be one of those scraper sites. Haven't heard from you in awhile, hope you are well and busy getting stuff out for fall. Hi Kathleen, All's well. I've been very busy with back to school fall shipping. I've sent a lot of DE's to your forum in the past couple of months, Fashion-Incubator.com. 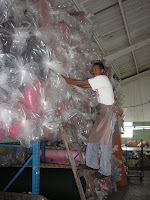 Everybody this is the best resource on the web for apparel production! The article on the other site is republished with my permission. I submitted the article to ezinearticles.com to help with link building. I love reading your posts! I always learn so much.